Purple Land Management is a full-service gas and mineral exploration company founded in 2010. Based in Fort Worth, the real estate company has been featured in the Inc5000 three times for fast revenue and employee growth. By fall of 2015, Purple started restoration on the historic Winfield building in downtown Fort Worth. An op-ed in the Dallas News provides additional backstory on the ambitious project that was to become Purple’s new headquarters. At the start of the Winfield restoration, Purple wanted a conference room elevator and contracted with c2mtech to make it functional. Built in 1919, the elevator was originally used to transport automobiles. It was a challenging project, due to the age of the building, limited space and mobile movement. Category 6 cabling was installed seamlessly into the floor, to power the data and voice connections within the conference room. Enough slack was provided to allow for flexible motion of the elevator, while maintaining voice, internet and power connections. Samsung LED TV’s were installed for presentations while ethernet and power connections are available in the conference table. Today, the elevator is transformed into a 360-degree glass enclosed conference room. Capable of being summoned by staff on any of the three floors and locked into place during important meetings. The elevator was a large project, but had a small footprint compared to the rest of the 42,000-square foot Winfield building. It was converted for office use in 1981, but was outdated and incapable of handling today’s technology demands. Atlas White Noise Speakers for sound masking were installed in the executive reception area, offices and bathrooms. Wired and wireless internet connections were added for a strong signal throughout Purple’s headquarters. Exposed category 6 cabling was installed on the ceiling for work connections, in purple of course! Surveillance for building security and employee safety became a requirement during the restoration. The project began at the end of 2015 and was ready for Purple’s employees by the beginning of 2016. Training by c2mtech was provided for executives and staff. Quick adoption and making technology easy is always our goal! Architects of the Winfield restoration, Bennet Benner Partners won a Preservation Award in 2017. 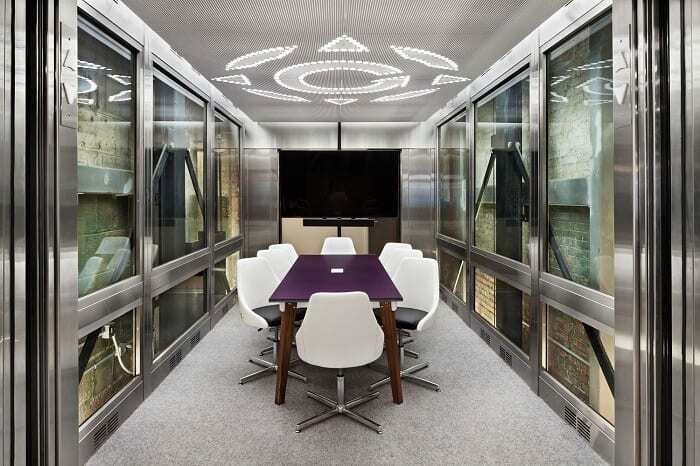 With c2mtech’s help and experienced telecommunications and A/V teams, the freight elevator was repurposed and transformed into a working elevator conference room. 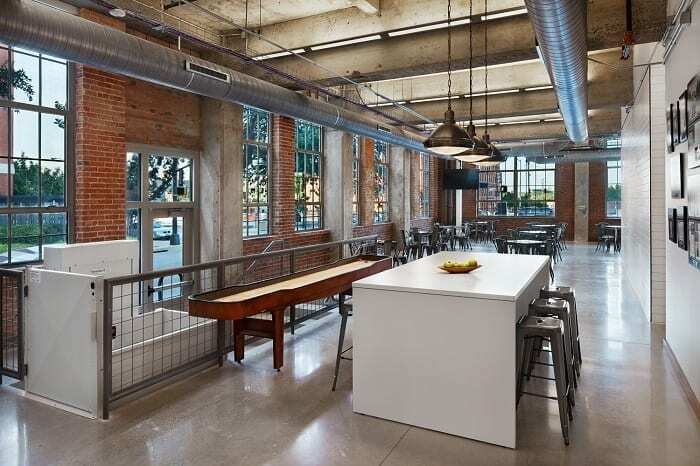 Purple Land Management now has a headquarters that can support a growing millennial workforce. With an open floor plan and mobile elevator conference room, Purple’s building and technology infrastructure are ready for the future.